Volucella bombylans var. haemorrhoidalis on dog rose. Galicia, Spain. Most of us can tell a bee from a fly, can’t we? We all have an idea about what each of them looks like: a fly is small and shiny; a bee is colourful, furry and buzzes about flowers. In fact most of us conjure up a vision of each based on experience. Birds probably do the same, associating a particular feature, shape or pattern with one or the other. They also learn which one stings and which one can be eaten without getting stung! They learn which one to avoid when looking for a quick snack! Bees, wasps and bumblebees are generally avoided because they have invested considerably resources in evolving a sting and manufacturing venom. Wouldn’t it be cool if you could pretend to be a bee, or a bumblebee or a wasp, without having to go to the trouble of making all that stuff! Of course some birds do eat bees (bee-eaters!) but most avoid them. Wasps such as hornets are top predators in the insect world and are usually left alone. Flies on the other hand get eaten by all sorts of birds (and wasps!). Better to be a bee. So it’s easy to see why a fly might want to look like a bee or a wasp: they would gain protection from being preyed upon. Resembling dangerous or unpalatable species (the so-called models) like bees and wasps, whilst being edible yourself, is called Batesian mimicry. Birds and other insect-eating predators learn through experience not to eat noxious prey items and thereafter do not distinguish between the two if they look alike. 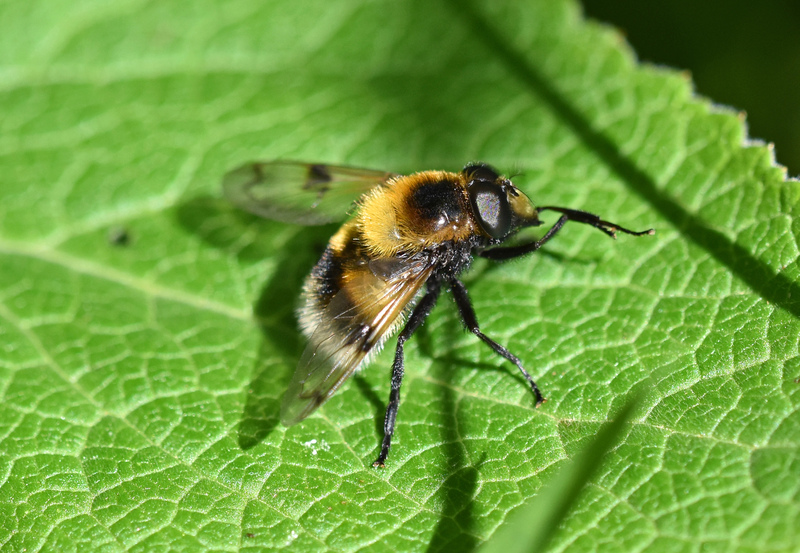 Volucella bombylans is a large hoverfly which has evolved to look rather like a bumblebee. Or more accurately, this species has evolved to look like three different kinds of bumblebees, because there are three different forms, or morphs, which each look very much like a specific kind or species of bee. 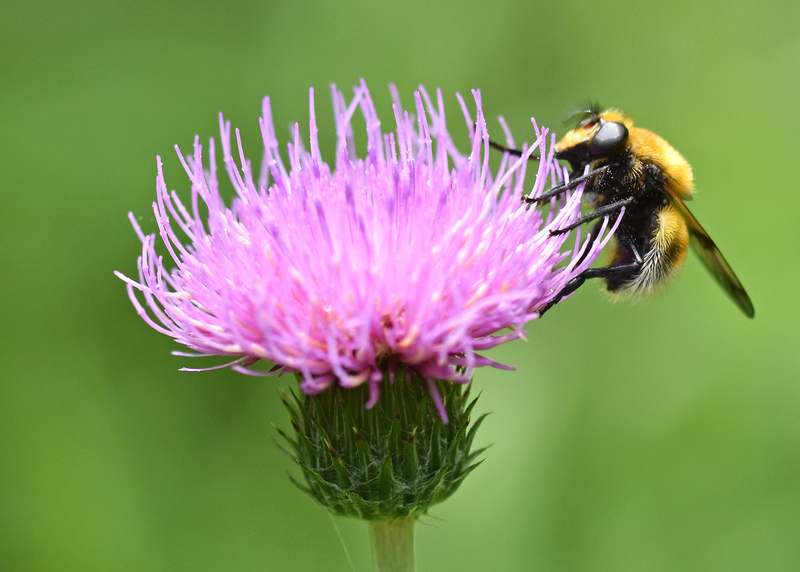 It is rather clever to have evolved a range of different types (polymorphism) because it means that the species can fit in with a range of different bumblebees, depending on which species are most common in different places. Let’s look at the different morphs. Volucella bombylans var. plumata (above and below) resembles Bombus terrestris (L.) in morphology and behaviour. 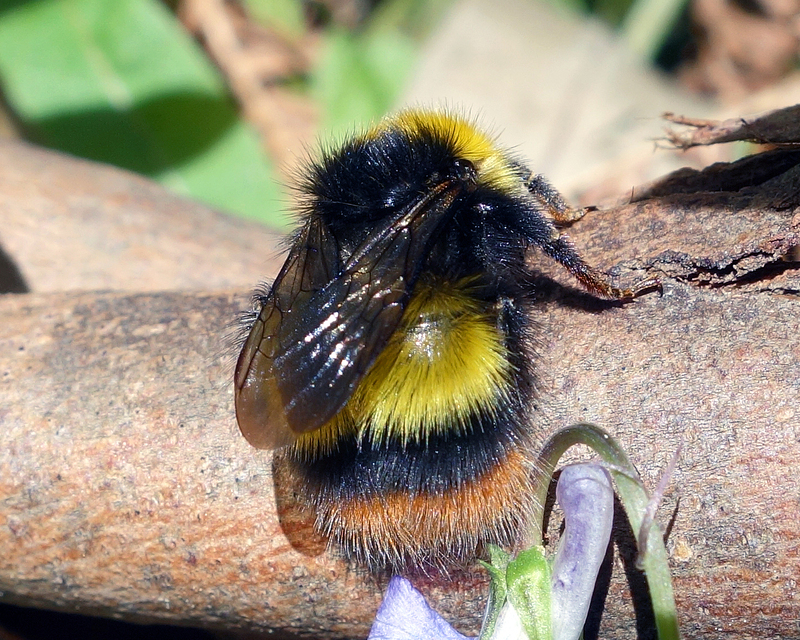 In this case B. terrestris can be thought of as typical of a number of white-tailed or black and yellow bumblebees, such as B. hortorum and B. leucorum. Volucella bombylans var. plumata. Galicia, Spain. I’ll leave you, dear reader to decide whether this form (V. bombylans var. 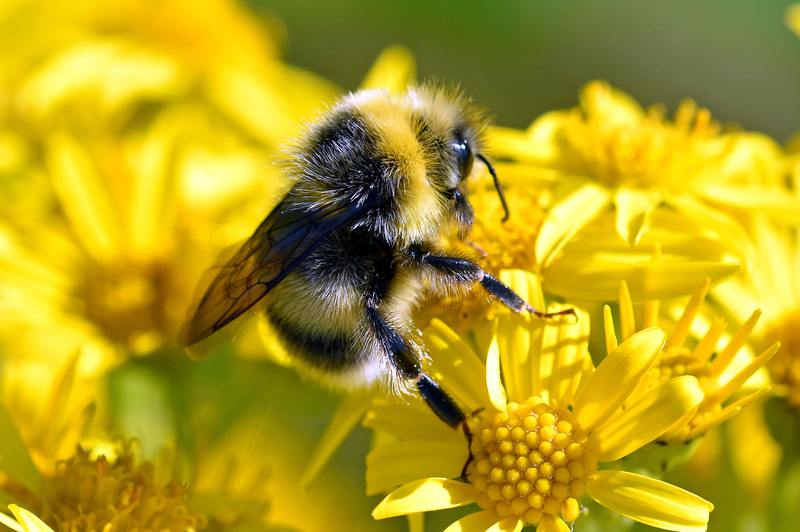 plumata) looks like White-tailed Bumble Bee (Bombus lucorum) (shown below). The next morph, Volucella bombylans var. 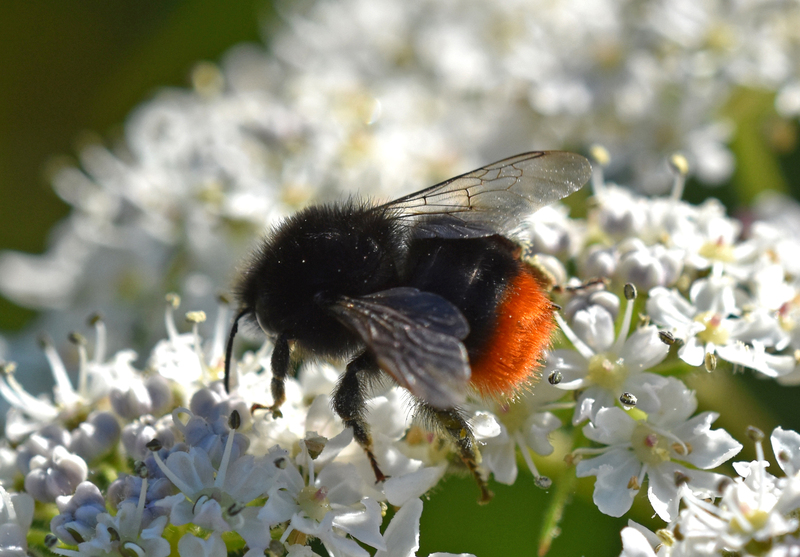 bombylans, has an orange-red tail (below), and mimics the Red-tailed Bumblebee, Bombus lapidarius (second below). Finally, a third, and much rarer form (at least in the UK) is called Volucella bombylans var. haemorrhoidalis. I was fortunate to come across one of these lovely red-tailed forms in Spain (see below). It is a very good mimic of the Early Bumblebee (Bombus pratorum) (second below) which was also photographed in the same area (Galicia, Spain). Volucella bombylans var. haemorrhoidalis. Galicia, Spain. Early Bumblebee (Bombus pratorum). Galicia, Spain. 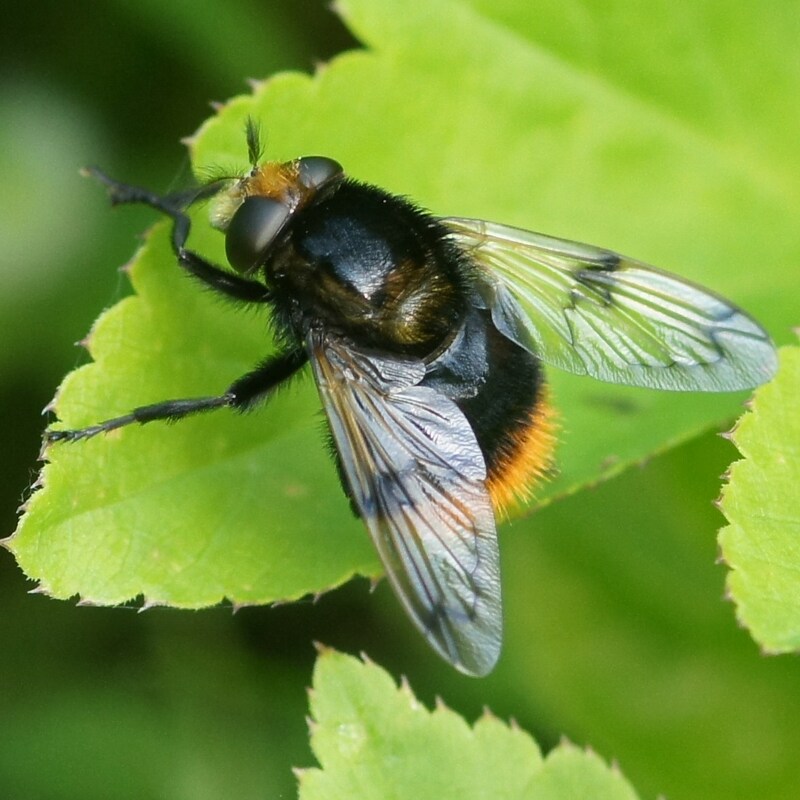 The different subspecies, or morphs, of Volucella bombylans are generally considered to be very good (or ‘perfect’) mimics of the bumblebee models. I think the word ‘perfect’ is rather misleading; a perfect mimic would be an identical copy would it not? These flies look quite a lot like the bees they are trying to imitate, but they are a long way off being perfect! Perhaps, like parents, mimics don’t have to be perfect, just good enough! For a discussion of imperfect mimicry: see Quicke (2017). It is generally agreed that among hoverflies, there are many more so-called, imperfect or crude mimics of honeybees and wasps than perfect ones. In other words, many hoverflies appear to us humans to be rather poor copies of the original, bee or wasp, they are attempting to resemble. 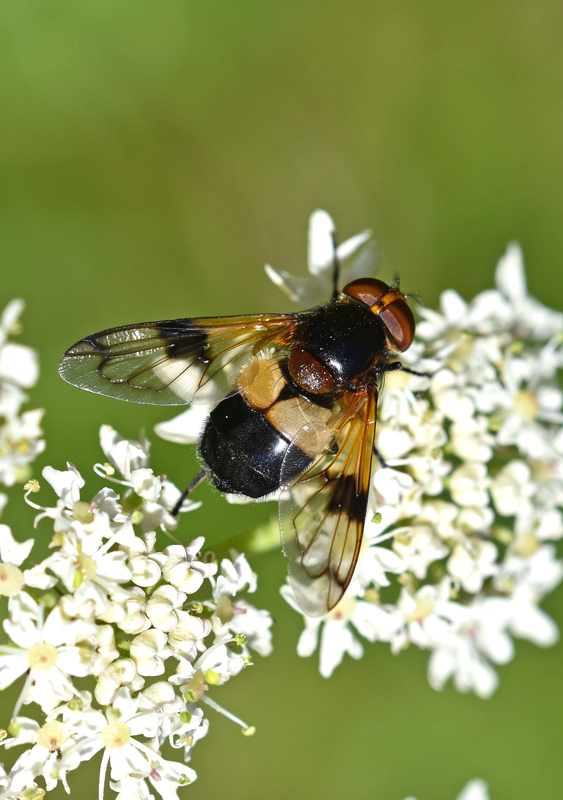 For example, the Pellucid Fly (Volucella pellucens) – see below – is thought to be a poor, general mimic of bumblebees (Gilbert, 2005). It doesn’t look anything like a bumble bee to me, but birds may have some sort of search image which lumps the two together. These imperfect mimics, or ‘not very good copies’ in everyday language, probably work because predators such as birds make certain generalisations when looking for prey items. For example. when snatching insects out of the air, most birds will presumably avoid anything that looks vaguely like a bee and a wasp, so some protection comes from being a poor copy of an avoided species. It may simply be that birds are not very good (or ‘constrained’) at recognising certain patterns (Dittrigh et al., 1993), although I find that a little hard to believe for species which exist by catching insects for supper! Maybe they know it is a bit different, but sufficiently bee-like to give it the benefit of the doubt and move on to looking for a genuine fly! It’s just not worth being stung; easier to avoid anything vaguely bee- or wasp-like! We also need to remember that mimicry works in many dimensions, not just physical appearance. The hoverfly mimic might not look much like a bee, but it sure as heck behaves like one! “Hoverfly mimicry of honeybees, bumblebees and social wasps involves similarity of colour, morphology, behaviour, ecology and phenology.” (Edmunds, 2008). Some hoverfly mimics have even evolved the same sort of behaviour patterns as their models: Volucella bombylans var. plumata was found to be active at the same time of day as Bombus terrestris (Howarth et al., 2004; Howarth & Edmunds, 2000). Easy to hide in plain sight when all the genuine bees are most abundant! It also pays not to get too common, in other words to be much rarer than the real McCoy (i.e. the genuine article). If the hoverfly mimics were commoner than the models, birds would be more likely to first catch the mimic (fly), rather than the model (bee), and thus never learn that bees were nasty and can sting! 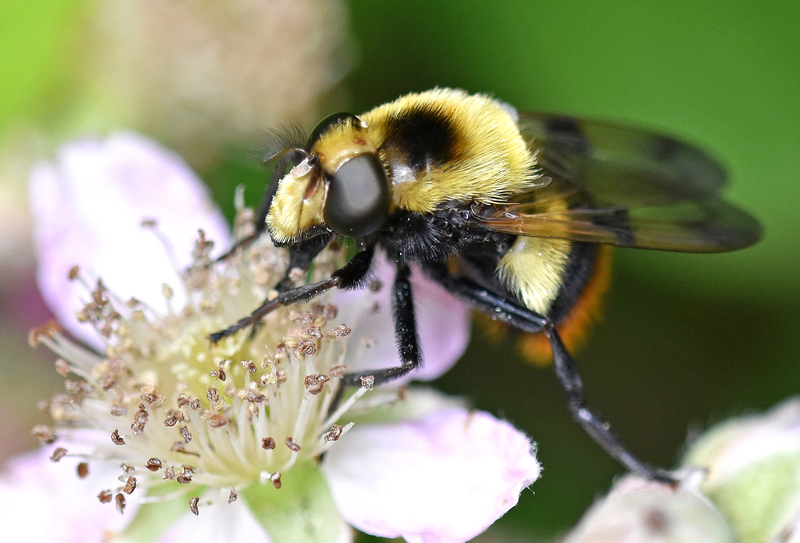 “the remarkable resemblance of V. bombylans morphs to common bumblebee species provides them with protection from predation, and hence that bumblebee community composition determines equilibrium morph frequencies in any given V. bombylans population” (Edmunds, M., & Reader, T., 2014). 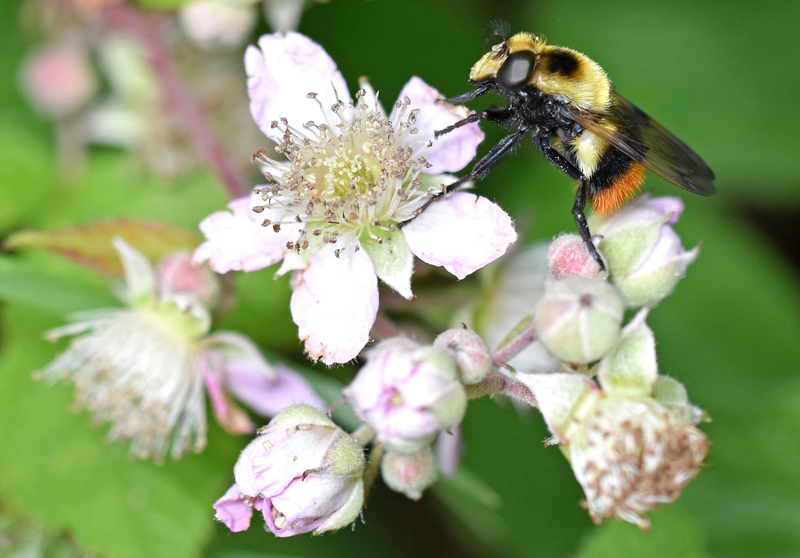 Finally, these bumblebee mimics not only look like bumblebees, they also parasitise them! But that’s another story. Dittrigh, W., Gilbert, F., Green, P., McGregor, P., & Grewcock, D. (1993). Imperfect mimicry: a pigeon’s perspective. Proc. R. Soc. Lond. B, 251(1332), 195-200. Dlusski, G. M. (1984). Are dipteran insects protected by their similarity to stinging Hymenoptera. Bull. Mosk. O-Va Ispytatelei Otd Biol, 89, 25-40. Edmunds, M. (2008). Hoverflies: the garden mimics. Biologist, 55(4), 202-207. Edmunds, M., & Reader, T. (2014). 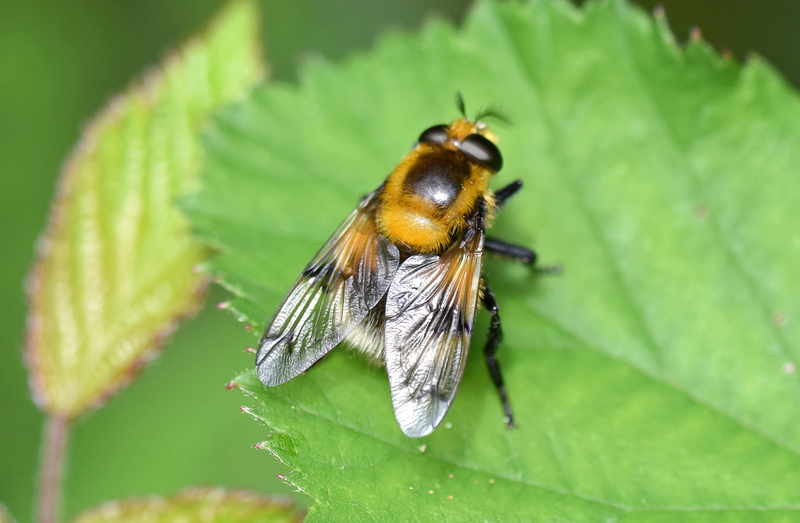 Evidence for Batesian mimicry in a polymorphic hoverfly. Evolution, 68(3), 827-839. Gilbert, F. (2005). The evolution of imperfect mimicry. In Symposium-Royal Entomological Society of London (Vol. 22, p. 231). Howarth, B., & Edmunds, M. (2000). The phenology of Syrphidae (Diptera): are they Batesian mimics of Hymenoptera?. Biological Journal of the Linnean Society, 71(3), 437-457. Howarth, B., Edmunds, M., & Gilbert, F. (2004). Does the abundance of hoverfly (Syrphidae) mimics depend on the numbers of their hymenopteran models?. Evolution, 58(2), 367-375. Another interesting post, thank you! They have certainly fooled me Ray, check out the image on my post ‘Macro World’ ! It’s the eye shape. Also on a facebook group I’m a member there was some debate as to whether these should be called mimics, I can see the persons point as they have evolved not just ‘dressed up’ but we know them by this name.